Is the UK really ready for an online only mainstream TV channel? The decision has been made and the timeline is now known, BBC Three will effectively be an online-only TV channel from February 2016. The big question mark is how many of the target audience for the channel will be forced to miss out because their broadband is not up to scratch? Our speed test gives us a unique idea of what people have actually purchased and the experience they are getting from their broadband. It is this difference between what is available to people and what they decide to buy along with what the providers think they deliver to people that will be critical to whether BBC Three thrives or shrivels when online only, in theory the demographic of its audience is the one most likely to watch online, but if your broadband is too slow or you don't know about a new programme you won't be watching it. The speed profile above plots the tests we saw in the third quarter of 2015 and shows that 14% were getting speed test results below 2 Mbps (2 Mbps if delivered reliably should sustain a SD video stream). This improves by 1 or 2% if you eliminate those testing on tablets and mobiles. The small notches in the curve are usually linked to the maximum speeds of the various products but as we have shown when looking at peak time speeds while fixed connection speed services like Virgin Media cable don't suffer from distance drop off peak time performance can cause problems, hence why we see some people (and even industry figures) who say that they need a 100 Mbps connection to stream HD reliably. The BBC has contributed to the phase 1 superfast broadband roll-out via the remains of the Digital Switchover fund forming a core chunk of the Government money used, but there is still a long way to go in terms of take-up of faster broadband options, and it is possible that the switch of BBC Three may help to wake people up to the availability of faster broadband options. 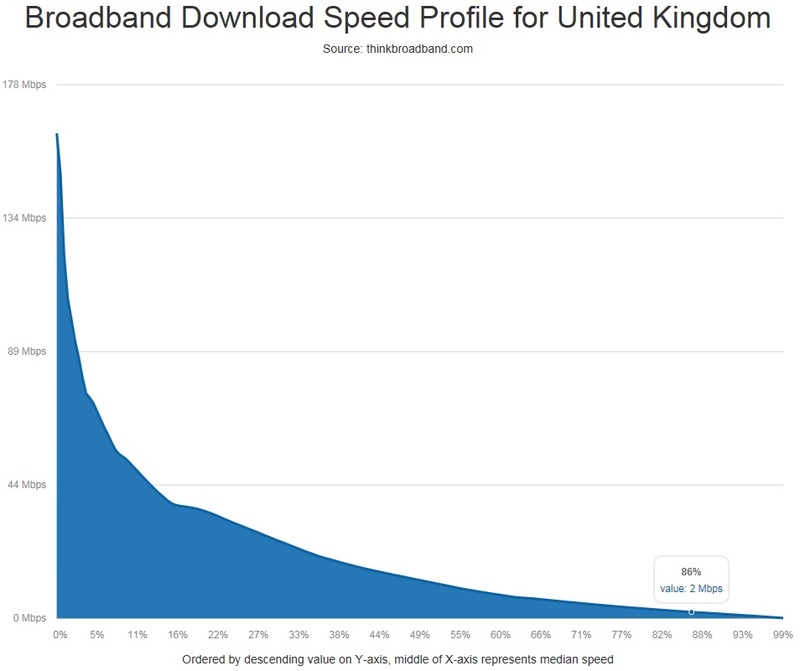 The debate over whether the money spent on improving UK broadband was a waste is a passionate one, but looking at the change in speeds over the last few years, it is clear that things have changed dramatically. Our availability checker includes analysis of the speed test results for the various parts of the UK and allows you to see when services like FTTC arrived in an area (or other changes like Virgin Media speed updates) and the effect this has had on average speeds. Unfortunately there are still those with the same speeds as back in 2009, one only has to look at social media everything improving speeds are mentioned but all the data points to things improving just not in a 100% uniform pattern with the short time scales people want. We are deciding to use Internet access as a Broadcast medium without describing the SLA for that datastream. Interesting. How much of the 500kbits per sec per month peak bandwidth am I expected to allocate to this service to assure it works? So the UK's high brow music channel is now a best efforts delivery with no special codecs. Internet delivery costs less to BBC than Digital Radio? This is a problem. In short - no, we are not ready for one mainstream channel never mind a complete conversion from OTA TV to online. But I remember ISPs turning the air blue over the 1st version of iPlayer. Their networks just couldn't cope with just one IPTV service, which was a trailblazer back then. Basically, the BBC is leading the way again (someone's got to be first to kick-start it) & hopefully people can take it up, but network providers have to provide the service at a reasonable price. There is no way a lot of the people on long lines can ever use this service. They are struggling now, tv streaming will be the kiss of death. There are millions on connections that are not fit for purpose, yet statistically they have 'superfast'. Many complain that everything buffers at peak times already, mainly because they have too many gadgets connected at once, and so does everyone else, and they all go for the cheapest ISP with the limitations that go with it. Digital britain is a superfarce. @VfM, are you getting your BBC 3s mixed up? This is the tv channel we're talking about, not the radio station. One of the conditions of going on line is that ALL content is shown on BBC 1 or 2 as well. So while I appreciate not all can run iPlayer, this does not exclude you. Personally I think that the BBC have too many tv channels (BBC 1,2,3,4 CBeebies CBBC, News and Red Button). BBC 3 and 4 don't start transmitting until 19:00 and the schedule for BBC 3 makes it look like it may as well be renamed BBC Dr Who. Add in all of the repeats on the other channels at prime time and I rest my case. @ CD There are far from millions with lines that are statistically superfast yet not fit for purpose. Yes, many have poor connections although that is steadily improving but none of those are superfast although a few may be connected to a fibre connected cabinet but be too far to benefit. Stick to the truth, keep on message, but don't lie or post falsehood. It doesn't help your cause. @JHo1 - D'oh, sorry that BBC 3 ..Radio 3 would be a more interesting challenge. Hardly noticed BBC 3. I suspect a large number are missing out. Up to less than a month ago, I was one of them too. Now I enjoy 'live' TV programs streamed from around the globe via the internet. No stuttering etc but then I do have a fast connection. As for BBC 3, can't say I'll miss it much. It'll just have to join the queue of countless other channels available to be viewed. And why does everybody think we watch the BBC only? Get a life! I guess a large proportion of the BBC3 target audience of young people probably won't even notice when it isn't part of the BBC terrestrial output. If the broadcast is simply switched to the internet that will also only get a very small audience. The young viewers will simply carry on watching the output via BBC iPlayer as they have always done. "Is the UK really ready for an online only mainstream TV channel?" The answer is no, because viewing habits have changed. Viewers demand unlimited choice. "Can UK broadband cope as viewing switches from terrestrial and satellite TV to the internet"
"online only mainstream TV channel?" "Can UK broadband cope as viewing switches from terrestrial and satellite TV to the internet?" Well if BT doesn't finish our FTTP install by that time then in our case and probably loads more, BBC would stand for "Buffering Buffering Channel", well it would on our broadband connection. You say that UK broadband is already coping with the switch to online video media and this is clearly true at the moment. However with 25% of users accounting for 75% of usage it may be that this transition has some way to go. As speeds increase it seems that users adapt and increase their usage to take full advantage. BT should see this as a green light for G.Fast. OFCOM should be thinking about the consequences of allowing BT to drop ADSL so they can optimise the speeds achievable on FTTC for rural areas where G.Fast will never be viable. With phase 1 finished in Surrey (SCC) the results on Thinkbroadband checker is showing .3% (1250 at 500k customers) receiving under 2meg the money invested in the OMR should cover the 10 meg section (1.6) with ease giving the above service to all of Super Surrey. Please get out a good continuous speed tester like 'netmeter' and try a stream like BBC Iplayer- I tried the most popular one of docwho - It streams at an average of 10Mbps, and each 'update' is quite widely spaced.. so even with a large family of 5, for some reason all *separately* streaming the same one, would not have problems..
You do realise that a)Surrey is probably the most affluent part of the UK and b)your constant trumpeting of 'Super Surrey' is tedious and c)there is another country outside of Surreys wonderful borders? Remember some of the Surrey Exchange Customers who are in the .3% (2meg) + (10 Meg) cross into Hants and West Sussex border and visa versa so I am trying to surport each home rich or poor. @BM - who do you work for? I do not work for anybody only a cop of tea if it is offered on a free visit. BBC3 (tv) mainstream? We do have problems with our definitions on here, don't we? If only Thinkbroadband maps had adjusted all the post code radius range to 250 Mtres (Eg two spans and a spur) this would have stopped over lapping of Cabs data making the average 6 month profile more feasible. @blackmamba please explain how a 250 metre radius would stop over lapping cab data? It would not stop it, there might be less but it would not stop it. You also appear to have not noticed we supply the postcode of the actual postcode rather than a radius if there are tests in it. This is in addition to the radial speeds. See results on post codes (GU266HZ,GU102NZ) GU102NX the first two are on CAB 12. Hindhead and the other is on Cab 6. Headley Down. You may be overwriting the Plusnet post code tonight. Oh, great yet another service I wont be able to take advantage of due to my poor home broadband. Post Code GU102NY covers both Hindhead Cab 12. And Headley Down 6 more customers on Headley Down Cab 6 giving 24 meg. @BM - clearly postcode boundaries and cabinets areas do not coincide. And using postcodes is the only way of not identifying specific properties. both show the tests done in the precise postcode. And GU26 6HZ where someone ran a test 10th November will be rolled into the local analysis in the next few days, i.e. data processing is underway. The post code does identify the homes by the address and it's GPS position or lat/long which at times shows on the map layers checks ,these can be made on the Openreach web/page just type in post code and wait for the address to be supplied. @BM - you do know the shape and size of postcode areas vary considerably? The lat/long provided by Royal Mail is somewhere in the centre but please explain what you mean by radius adjustments. TBB does not require the actual address. Please explain 'two spans and a spur'. Comnut. The post code has a GPS position use google maps type in GU266qd and I am located aprox 80 Mtres from it at Saffron. All that is required in a simple D/Base on FTTC is the GPS position of the FTTC and the post codes GPS even better if you have the position of the house but you most split the Cabs over the Exchange Area to get good results. As the FTTC is in (Wood Road by the Church ) you can work out the speeds I can receive at my home master socket from any ISP from the information above. The speed on the post code is mine but I have been using a I/ pad number 1 so it is a red herring. If anyone wants to fund a team of a dozen to take the analysis down to the premise level with appropriate verification of locations via Streetview or actual visits to stand at cabinets with a GPS locator then feel free. "One of the conditions ... is that ALL content is shown on BBC 1 or 2 as well." Now what might she see watching BBC1 or BBC2 ("safe channels") late at night when she can't sleep!? Either go entirely online or stick to what we have got! Monthly data allowance - how to use it? "Speed" & Reliability - does it work? The latter two I suspect are more complex than most think. iPlayer on my T4300 W7 laptop over the "same connection" often stutters. What will upset me when BBC3 goes online only is having to retune my Freeview devices. Satellite broadcasters can manage to introduce channels without us having to take action. Freeview missed a trick somewhere. BrianWood "What will upset me when BBC3 goes online only is having to retune my Freeview devices. ... Freeview missed a trick somewhere." I think this varies by device. When YourTV was introduced it just became available on my Smart TV (I needed to add it to the favourites list that I use to ensure quick access to the channels of interest). Likewise when ITV4 became available on FreeView Lite it showed on my mother's digibox without retuning. No, we are nowhere near ready for TV to be delivered exclusively via the internet. A Standard Definition (SD) TV service requires around 4 mbps (unless the compression methoid changes to get more data through at the expense of quality). So a great many will not be able to watch BBC3 - especially if there are other calls on the service. If you want and UHD (Ultra High Definition, known as 4k) service that requires at least 16 mbps alone. If there are other users also watching on-line services the total data throughput has to be shared - and few have a service fast enough for more than a couple of '4k' channels at the same time. Then add the other uses, on-line shopping, Facebook, etc.They all take 'bandwidth'. SD BBC1 on Freeview needs about 2GB per hour, equivalent to your 4Mbps. However, that is the older, inefficient, MPEG2. H.264 allowed HD BBC1 to be around 3GB per hour, or around 6Mbps. But streamed over the internet, you get to see H.264 even for SD channels. iPlayer reckons HD there is about 3.5Mbps, while they run SD at around 1.5Mbps. 4K TV will not be considered "mainstream" for a long, long time.